On November 5 2015, a dam situated in the State of Minas Gerais (Brazil) collapsed, spreading millions of litres of mining waste. It contaminated many rivers from the Rio Doce basin, directly affecting the livelihoods of a great number of people from Minas Gerais and Espírito Santo states, and destroying the habitat of many plant and animal species. It also took the lives of 19 people, completely destroyed the village of Bento Rodrigues, and caused serious direct damages to the village of Barra Longa. It was Brazil’s biggest environmental disaster to date, and its consequences are still being measured and evaluated. The responsible company – a joint venture between mining Vale do Rio Doce and BHP Billington – knew the risk existed but took no action to prevent it. The disaster affected tremendously the lives of the ones directly impacted, and also reflected in the academic community that began concentrating research on the area, and in the job market in the region given the efforts to reconstruct, repair and restore the damaged landscape. Notwithstanding, the pace of such efforts have been pretty slow with regards to the reparation and compensation of the affected population that have lost their sources of income, their access to clean water and, in many cases, their physical and mental health. Furthermore, since the disaster, the local population has been intensively approached by technicians, journalists and researchers to supply them with data, but has seen little change in living conditions. Therefore, the affected population has become tired of being contacted and is currently making it difficult for anyone to request information from them. 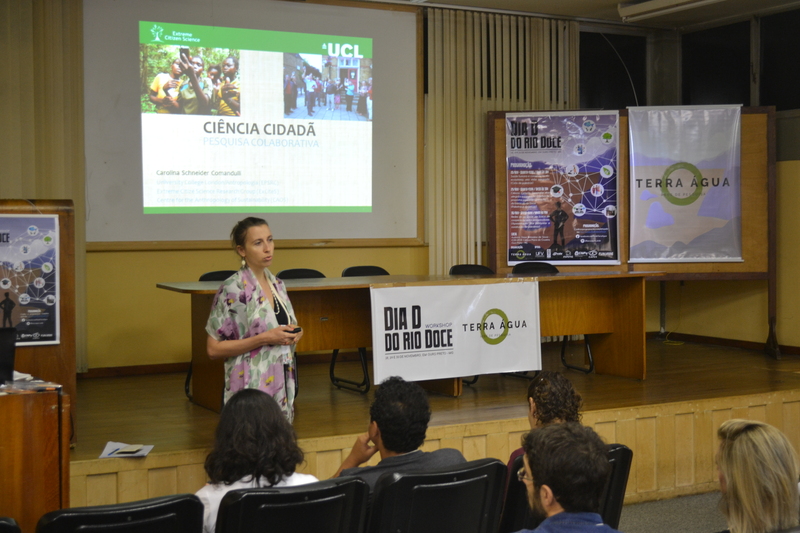 Three years after the disaster, a network of researchers from Minas Gerais, named Terra Água (“Land and Water”), organised a workshop entitled “Day D of Rio Doce”. The researchers are concerned with the overall disaster and are specifically apprehensive with the existing gap between academia and civil society and with the lack of engagement and coordination among the numerous research networks working on the disaster. They invited me to the event both to talk about (extreme) citizen science and to promote a workshop activity on the subject. Given the lack of communication between local actors and within academia itself, the organisers thought citizen science could cast some light on the situation and dedicated a full day to the topic. The first day of the event focused on preliminary results of research carried out in the impacted region. It ranged from environmental impacts to health impacts, and the idea was to look for connections between them. The second day was on citizen science, when I had the opportunity to present concepts, principles, and cases. Citizen science is not a well-known subject in Brazil. A great part of my intervention was on the work of the Extreme Citizen Science research group and on my own research with the Ashaninka people. In the afternoon, I ran a workshop activity in which I split the audience into groups and invited the scientists to explain their research in an uncomplicated language, listen carefully the problems/demands of the affected population and think together about how science could help solve the challenges. Also, I asked the groups to raise ideas on how to overcome the existing communication barrier with the local population. The exercise resulted in a great debate and in a series of recommendations for future citizen science research in the area. The main lessons for the participants were, on the one hand, about the importance of being sensitive to local contexts and of being communicative when one wants to carry out research with vulnerable populations and, on the other, about the potential of research to transform real-world problems when science gets closer to the non-academic audience. Finally, the third day was dedicated to the presentation of the many research networks that are working in the impacted region. The attempt was to begin integrating groups and initiatives to exchange data and to avoid replication of research in the area. As to citizen science, the subject was a novelty to most of the audience and was received with enthusiasm. Hopefully, in the near future, citizen science may help bring people closer together.